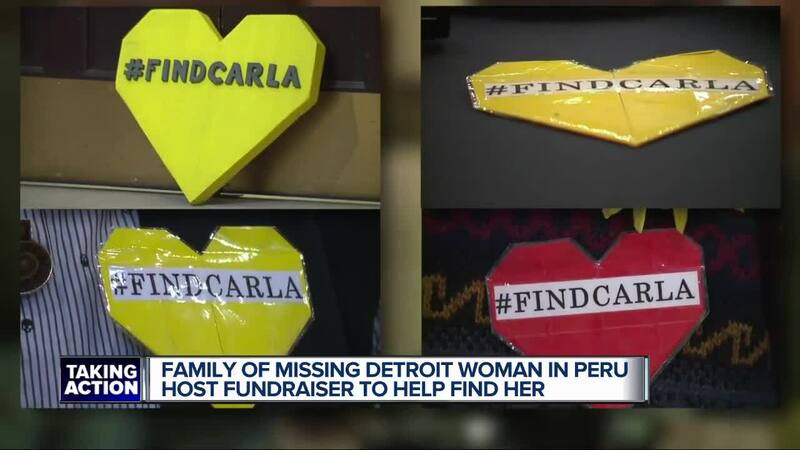 DEARBORN, Mich. (WXYZ) — Friends and family held a fundraiser at the Arab American National Museum Saturday night in Dearborn, where Carla Valpeoz worked, to raise funds to help find the missing Detroit woman who was last seen in Peru. “It’s been incredibly painful, my family and I have suffered quit a bit,” said Carlos Valpeoz Jr., Carla’s younger brother. Carla was reported missing in Peru on Dec. 15. She was there for a wedding, on a mission to see the world before losing her eye sight because of a medical condition. Her friends last saw her entering a hostel in Cusco. The family provided 7 Action News surveillance video of Carla in the nearby town of Pisa the following day. She told friends she was looking forward to visiting an archaeological site in that town. Carlos says there is little physical evidence to point he and his family in the right direction of his sister. “We believe that something may have happened to her in that park," Carlos said. "Whether she was abducted, whether she suffered an accident and somebody covered it up, or whether she was entered into some kind of human trafficking ring." “Carla you know we love you so much. We love you so, so much we are all here for you," Carla's friend, Alicia Steele, said at the fundraiser. "We are all going to dance, listen to music, eat some of your favorite food. We need you home with us." Carla’s father, Carlos Valpoez Sr., sent in a video message from Peru, where he has been ever since his daughter disappeared. “God bless you all and thank you for your prayers," Valpeoz Sr. said. "Thank you for everything you are doing we really appreciate that." Money from the fundraiser will go toward keeping Valpeoz Sr. in Peru so he can search for Carla. “My father being down there and his presence is putting a lot of pressure on the Peruvian government, as well as the U.S. Embassy, to make sure they see this case through,” Valpeoz Jr. said. The family created a GoFundMe page for anyone able to contribute funds to find Carla.